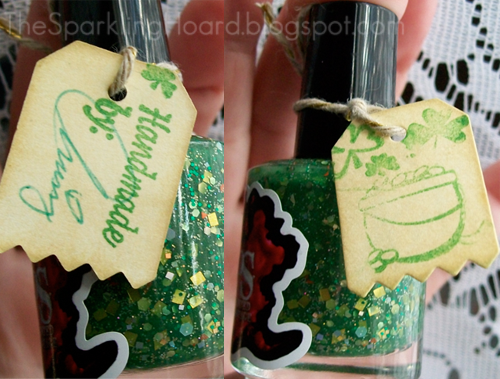 The Sparkling Hoard: Painted Sabotage: Greenie In A Bottle! Super excited to share this post because my fiance named this polish and won a bottle of it for me! 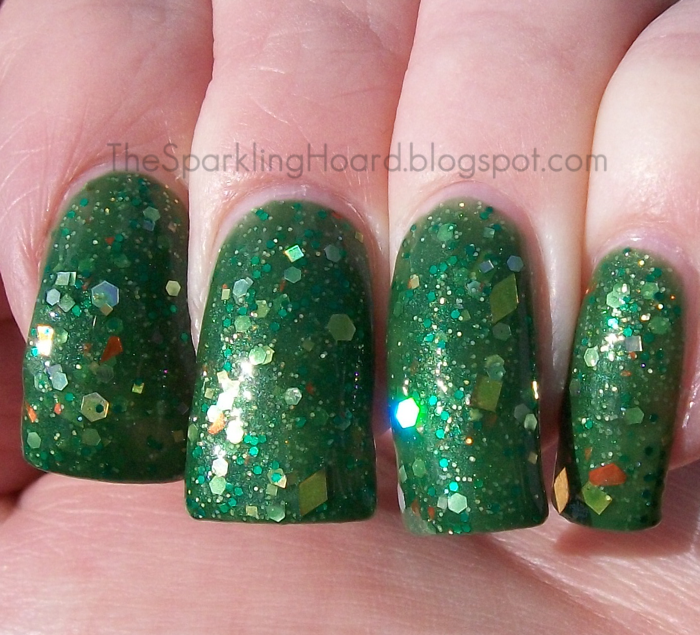 Chrissy from Painted Sabotage held a contest to name her new St. Patrick's Day color and since my fiance loves terrible puns almost as much as he loves me, he submitted the name "Greenie In A Bottle." People then voted on the names and he won! 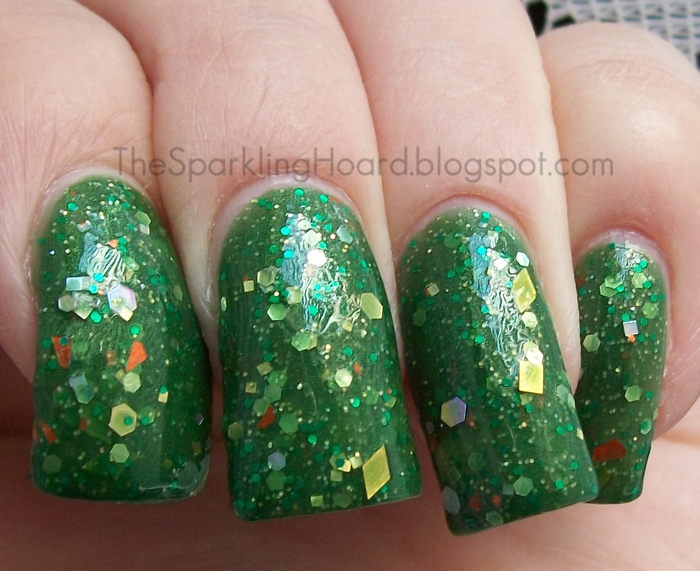 Greenie In A Bottle is a rich, medium green jelly filled with various sizes and shapes of gold glitter, gold holo squares and hexes, metallic orange shard glitter, and small, metallic green glitters. If you were to puree a leprechaun, this is what it would look like! Formula was great, as always. Dry time was a little on the slow side, but that's to be expected with jellies. I was perfectly happy with just 2 coats, but if you tend to do very thin coats or have very visible nail lines, you may need 3. The super cute tag that was tied to my bottle! Love it when the light hits a big holo glitter! Pow! 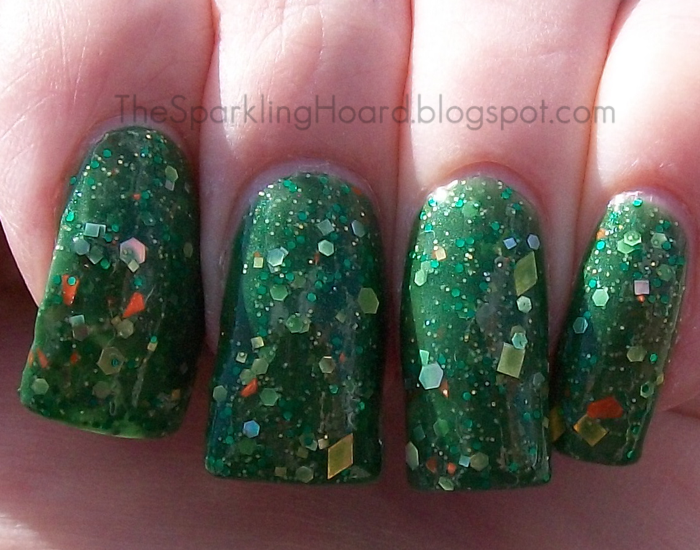 I know some of you are looking at these pictures and thinking the green and orange combo just isn't your thing, but it's really a beautiful polish in person. 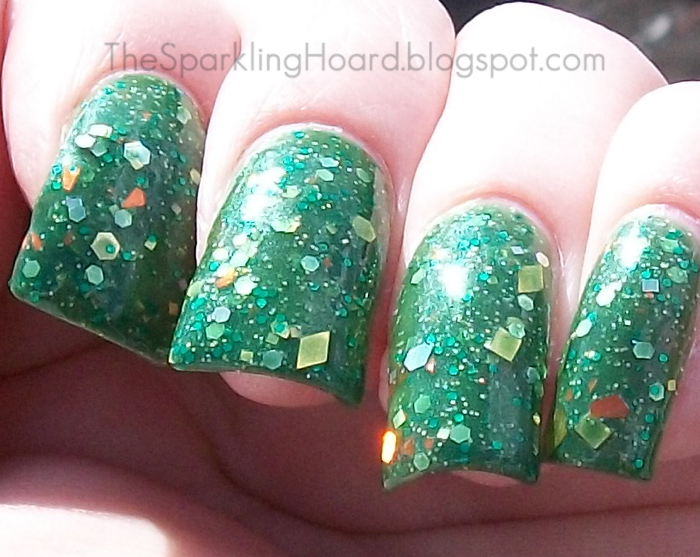 It's also pretty unique as far as St. Patrick's Day polishes go, so I think it's a great addition to any polish addict's stash! Greenie In A Bottle costs $9.75 for 15mL. You can buy Painted Sabotage products HERE and stay up-to-date on Painted Sabotage news on their Facebook page HERE.